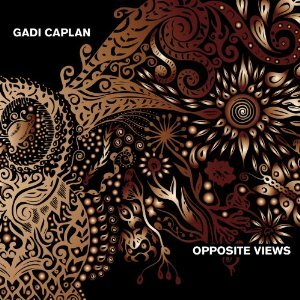 Gadi Caplan is an Israeli guitarist and composer based in Boston USA. He originally trained as a classical pianist from a young age, before switching to guitar where he devloped a love of Blues and Rock. He's also studied the Sitar and Indian music, Jazz, fusion and funk, so has a very diverse musical background. This album is an almost completely instrumental album with only one track (Nocturnal adventure) having any vocals. Instrumental albums often fall into the trap of being quite dull and uninsteresting - nice to have on in the background but not something you listen to by choice. Given this, I approached the album with some caution, but I'm happy to say that it has exceeded my expectations. All the tracks have their own character and stand out from each other which makes this an interesting album to listen to. The range of instruments used also helps with flutes, violins, violas and saxophone supplementing the usual drums, guitar, bass and keyboard. This use of different instruments in different songs reinforces the differences between them. Flute and violin are used beautifully in "Opposite views" for instance to create a lovely gently elody, whereas "Euphoric moment" uses the sax to give a real Jazz or Blues feel. I'm not a big fan of instrumental albums normally, but I have to say, this is an album that by far exceeded my expectations and is one of the best instrumental albums I've heard for some time. Well worth a listen.